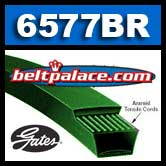 BladeRunner 6577BR Outdoor Power Replacement Belt, MTD, Murray, AYP, Bob-Cat, Homelite, Simplicity, Snapper, Toro, Exmark and more! Aramid/Kevlar Wrapped. 1/2" W x 134.38" L Outside. Premium Gates OEM replacement.